I exit through the door of my daughter’s brand new school in Stouffville, Ontario and with the concrete edifice behind me find the residential neighbourhood the school occupies silent. I am on my way to work in Toronto and soon need to join the flow of commuters heading into the metropolis. 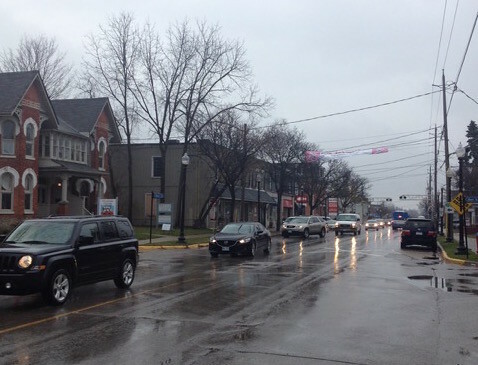 But before I do head to work, I drive along tree-lined Orchard Park Boulevard to Main Street where I park my car and start walking. The street is busy with those Toronto-bound cars but I am moving on my own two legs and feel liberated. 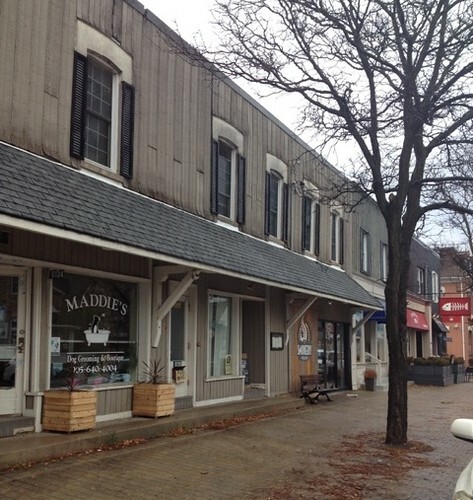 Stately century-old red and yellow brick houses with filigree patterned bargeboards have a front row seat to Main Street’s spectacle of modern life. Some are still the homes of local people. Others are businesses, like the Renew Integrative Health centre. Further on, two neighbouring houses along my route reveal to me a forest garden, now ready for the cold snowy months ahead. This garden is a world of fresh cool air where moments of solitude, away from the anxiety of urban life can be found with ease. Near the end of my brief walk I pass a clapboard row-house. Comforting thoughts of eating ribs with my children, wife and her sister flow through my mind when my eyes catch “The Smokery” written on one of the row-house’s windows. Inside this restaurant, we experienced many pleasurable moments and talked about travels and how our children are growing quickly. 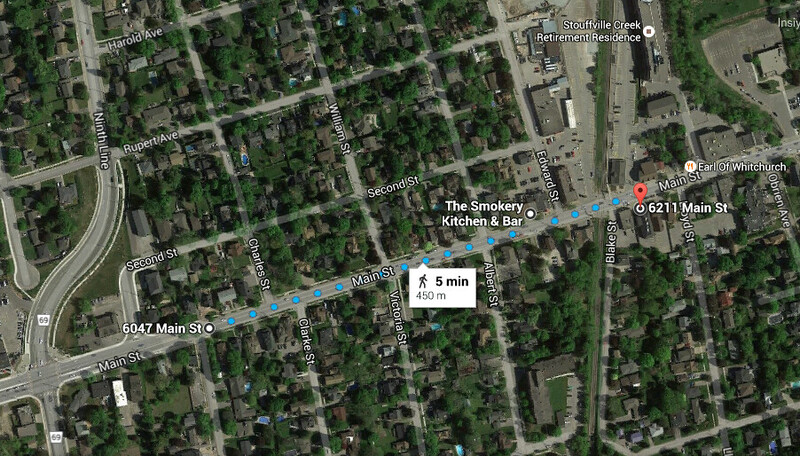 The Smokery, I discovered online, opened for business only in 2014. Yet already it feels as if it has been in the neighborhood for years and years. Chris Waye, the chef and owner, is energetic and welcoming. His ribs delighted our familial palate with their sweet woodsy flavor. The Smokery is one of many businesses that have thrived in the clapboard row-house on Main Street since Joseph A Todd built it in the 1890s. The neighborhood around the building was also home to a bustling lumber yard, feed mill, and foundry. Today, a Home Building Centre carries on this industrial tradition. I stop my journey at the Stouffville commuter train station, a small one-storey edifice built in the final decade of the 20th century. It has a neat red brick foundation and pistachio-coloured wooden panels for its outer walls. The railway line outside the station first felt the thunderous rumble of a train in 1871. 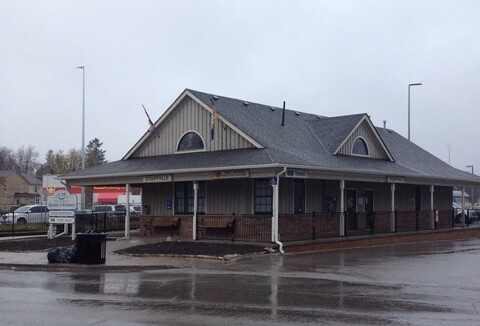 Stouffville Station during the Victorian era was a two-storey house with a sloped roof and flapping shutters attached to the upstairs windows. Before the Toronto and Nipissing Railway came to town carrying passengers as well as timber from northern Ontario it had actually been a local family’s home. Authorities tore it down in the 1980s to make way for the station that people use today. The friendly woman selling tickets in her office at Stouffville Station and the racks full of brochures advertising such places as Georgian Bay stir up wanderlust in my imagination. In reality, the eight or nine people milling about the property await their ride to the business towers and educational institutions of Toronto. We are within the Greater Toronto Area. I will be in the city before I know it, busily taking care of work responsibilities. My short morning walk will keep me calm even when I confront life’s petty annoyances. Walking I realized long ago is great for the mind. Post and images by Piotr Rajchert, a father of two preschool-aged children who inspire him with their curiosity for the world. He lives with his family just north of Toronto, Ontario.